With the advent of new and enhanced technology for incident analysis, management and real-time tracking, there is an opportunity to re-think the roles and procedures to improve the efficiency and safety of wildfire management operations. Join us to thank our sponsors and exhibitors and network with the fellow conference guests while enjoying hors d’oeuvres and a no host bar. Johnny’s specialty: a meditative journey through fire-dependent ecosystems of the Northern Rockies. Join us in the Student Rec Room to socialize over music, fun, and games. Featuring ‘Red Skies of Montana’, a local favorite. Although this is a student planned event, they would like to invite all “Students of Fire” to enjoy the movie. A gentle-flow class for all levels aimed at waking one’s mind and body for the day’s activities. It can be done in any loose, comfortable clothing. 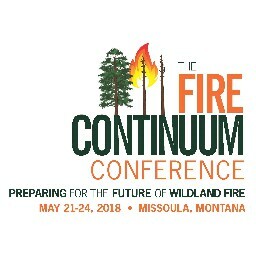 Special Session: Climate change and altered fire regimes: what should we expect? Gentle, light-hearted stretching. Quietly come in after class starts or quietly leave before it ends to accommodate your schedule. Authors are expected to be present to discuss their poster during that period. Hors d’oeuvres and a no host bar will be provided during the session. Join the student group as we hike to the M with a guide that will tell us more about the area. Meet your guide in the foyer by the conference registration desk. All field trips require pre-registration; lunch and transportation are included in fee. Go to http://firecontinuumconference.org/field-trips/ for descriptions.